The Preamble has stood as the mission statement of the United States since the Constitution was made public and sent to the states for ratification on September 17, 1787. Millions of American students have spent time memorizing the paragraph. The opening three words: “We the People” have provided the inspiration for the growing inclusiveness in the American body politic for over two centuries. The Preamble says much more than “We the People”. Who created the United States? The Constitution’s Preamble has given Americans and people around the world the hope of a free and just society. The Preamble states goals and also points out the obligations of the United States government to the American people. The Preamble defines “We the People” as the creators of the United States. The United States as that creation owes loyalty to the People and a duty to follow their instructions. What does the Preamble mean by a “more perfect union”? Under the Articles of Confederation, the states had joined in “a firm league of friendship, for their common defence, the security of their liberties, and their mutual and general welfare” The agreement was among states, not people, and the union was weak and incomplete. 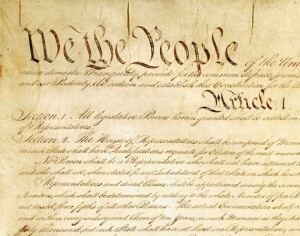 The Preamble’s statement refers to the Constitution’s purpose of improving upon the Articles. Modern readers likely think it impossible for something to be “more perfect”. At the time of the Framing, perfect was not considered an absolute term. In the 18th Century, “perfect” was still related to its Latin origin, perficere, to finish or complete. Thus “a more perfect union” was simply a more complete union than had existed before the Constitution. What does the Preamble mean by “establish justice”? In the second stated objective, to “establish Justice,” the key word is “establish.” The implication of the statement is that justice did not exist under the Articles of Confederation. The Framers had gathered from around the country and were aware of a problem. Although the individual American states and local governments had court systems with independent judges providing trial by jury, citizens traveling between states were not always treated fairly in the local courts. Gouverneur Morris, the final drafter of the Preamble and the Constitution, had chosen the word “justice” carefully. The lack of uniform “justice” throughout the country was clear to the Framers, and endangered individual liberties in many ways. To address this issue the Constitution created an independent Supreme Court with authority above the states and required the states to respect the privileges and immunities of United States citizens. These would be the means to “establish justice” for all citizens in the exercise of their inalienable rights. What does the Preamble mean by “domestic tranquility”? The Constitution was drafted only eleven years after Independence and four years after peace with England. English abuses of liberty were fresh for all the American people. They had not thrown off English chains to be now ruled by local tyrants. 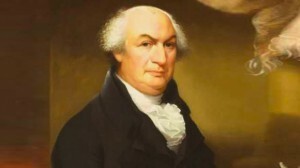 In 1786, Daniel Shays, a Revolutionary War Veteran had lead an armed rebellion against the tax policies and court procedures of Massachusetts. The Confederation Congress had no resources to restore “domestic tranquility”, although ultimately a private Massachusetts militia did. This Massachusetts disturbance was a major impetus for the Constitutional Convention. The armed revolt of war veterans against the state government shocked many. Keeping the peace and tranquility at home was an important concern. The Framers hoped a federal government with new powers and a uniform justice system protective of individual liberty would “insure domestic tranquility”. In a country born by revolt against oppressive government, such spirit remains alive, and the Constitution was drafted to balance that spirit with the benefits of civil society. What type of threats existed for the new nation requiring “common defense”? When the Constitution was being drafted, the new nation was in danger of attack from all sides. Spain claimed most of North America west of the Mississippi River, the Gulf Coast and Florida. Great Britain controlled Canada, and despite promises in the peace Treaty of Paris, maintained forts in areas between the Appalachians and the Mississippi River. Threats from hostile Native Americans existed on the frontier. No single state was capable of defending itself. The states needed each other to survive. Despite the threats Americans maintained a fear of “standing armies,” believing that armed forces sufficient to defend the nation would possess power to enslave it. Many Americans thought that, having won Independence over 18th Century’s super power Great Britain, guided by the Continental Congress, an American standing army was unnecessary and dangerous. The Framers, however, anticipated other wars and the need to be prepared to fight them. This anticipation overcame the fear of standing armies, but was balanced by a constitutional commitment to civilian control over any military needed for the “common defense”. What was “general welfare” as understood by the Framers? “Promote the general Welfare” had a well understood meaning at the time of the Constitution. “General” meant applicable to the whole rather than to individual, local or special interests. “Welfare” included the concept of “happiness” in addition to “well-being”. A constitutional goal is to promote the happiness of the nation as a whole. In both The Preamble and The Taxing and Spending Clause “general” refers to the welfare of the United States as a whole, not the welfare of a personal, local or special interest. In supporting “general” welfare, the government is to create the environment that allows every individual to exercise his natural inalienable rights to life, liberty and the pursuit of happiness without interference. What is the ultimate purpose of the Constitution as stated in the Preamble? The constitutional goals to form a more complete union, establish a uniform system of justice throughout the country, provide people with safety and security both at home and from outside threats and promote the general happiness of the nation, are all elements to achieve a single purpose. That purpose is to “secure the blessings of liberty,” not only for the country’s Founders, but for the generations to follow. The Preamble declares that the Constitution is designed to secure precisely the rights proclaimed in the Declaration of Independence. The Preamble proclaims the Constitution to be the fulfillment of the Declaration of Independence.